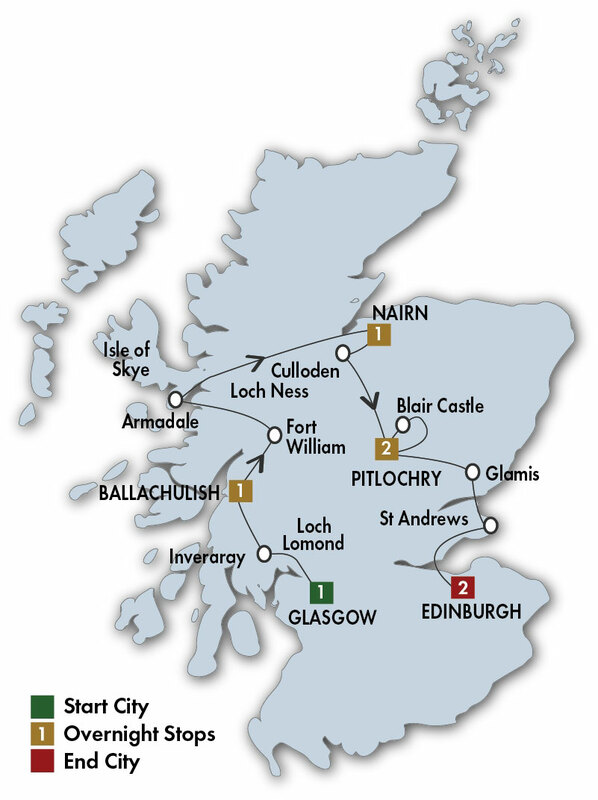 CIE Scottish Dream Tour - CIE Tours International tours. Lowest Prices! Expect an unforgettable evening of music, ceremony, theatre and dance with reserved seats for the Royal Edinburgh Military Tattoo on July 28 to August 18 departures. Immerse yourself in farm life at Leault Farm to see how a farmer works with highly-skilled dogs to herd sheep. Blair Athol Distillery Blair Athol Distillery is one of the oldest working distilleries in Scotland. After enjoying a leisurelyconducted tour, you can mull over the distinctive character of the finished article as you sip your dram ofBlair Athol 12 Year Old. Culloden Battlefield This is the site of the last land battle within the UK, in which King George II’s troops defeatedBonnie Prince Charlie and his Jacobite supporters in 1746; around 1200 people were reputedly killed.The Visitor Centre, opened in 2008, includes exhibitions, restaurant, shop and a landscaped roofplatform for views over the battlefield. Inveraray Castle Inveraray Castle is the ancestral home of the Duke of Argyll, Chief of the Clan Campbell and the iconic, must-see visitor attraction on the West Coast of Scotland. Kelvingrove Art Gallery & Museum The Kelvingrove Art Gallery and Museum is a museum and art gallery in Glasgow, Scotland. It reopened in 2006 after a three-year refurbishment and since then has been one of Scotland's most popular visitor attractions. St Andrews Golf has been played on the Links at St Andrews since around 1400 AD and the Old Course is renowned throughout the world as the Home of Golf. By the 19th century it was part of the way of life for many local people and golf. Golf still plays a major part in the culture and economy of St Andrews today. Dining Experiences:7 breakfasts (B) and 5 dinners (D)including a festive Scottish evening in Edinburgh.